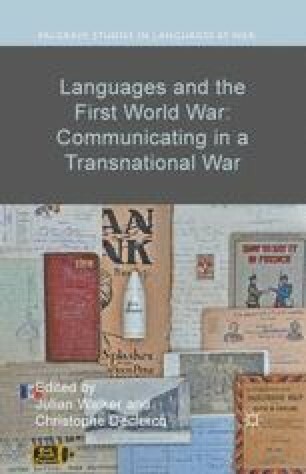 The collection of essays in this book developed from the conference ‘Languages and the First World War’, held at the University of Antwerp and the British Library in June 2014. That conference offered the opportunity to bring together several aspects of the wartime and postwar linguistic interpretations of the experience of the First World War: language collecting, change within languages, influences between languages, interpretation, status difference between languages, dialects and argots. The second volume deals with Memory and Representation; this first volume concerns Communicating in a Transnational War.